This editorial cartoon from the June 1, 1911 Indianapolis News poses the question to John and Jane Q. Public, "Did you see any of the estimated $500,000 spent by visitors to the city for the big 500-mile race?" The insinuation, apparently, is that all that cash was exchanged between "fat cats." 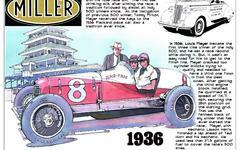 The cartoon illustrates that the Indianapolis Motor Speedway was big business to the city from the very moment it was born. There was a sense of extraordinary destiny to the place and its importance to Indianapolis - right from the beginning. And, like everything else that has dollar signs attached to it, it became a bone of contention, and, at times had political overtones.